I happened upon a wonderful sentou recently. The first time I was there, I had the fortune to come on a special day. The first Sunday of every month, they have a special bath. That month was a coffee bath. I must say, I enjoyed it thoroughly. This sentou is located in Asabu, at 36条 I forget which 丁目however. But it was a wonderful time for 420 yen. The first Sunday in July is going to be lilac. I have seen some great movies at the Stellar Place Mall theatre recently. Some I loved and some I just liked. But all I enjoyed. I saw "Wrath of the Titans", "Dark Shadows", "Underworld: Awakening" and "Men in Black III". I've also enjoyed a few on DVD recently as well including "The Hitcher's Guide to the Galaxy", "The Three Musketeers", "Love and Other Drugs", "War of the Worlds" and all the "Harry Potter" and "Underworld" series movies. I've also read a fair few books this past month as well. I've read at 7 of the Harry Potter books, "Anne's House of Dreams" the fifth book in the Anne of Green Gables series, the others I read earlier this year, "Game of Thrones" and I've nearly finished "A Clash of Kings" it's sequel and soon I will move on the third book in the series. If you're interested in hearing of any of these please feel free to pick my brain over them. Or if you've seen or read any of them please let me know your opinion of them and weather or not you liked them yourself. Sapporo has been enjoying so many festivals as of late I find myself hardly able to keep up with them all. Some I have enjoyed recently include Hokkaido University's School Festival. I found myself full and close to bursting everyday I went back. I also enjoyed the student preformed concerts. They had a few with beat boxers in the back whilst others sang, some with back up dancers are they sang along to pre-recorded backdrop music and some just played their hearts out on their instruments. But it was all good fun. I also catch some of the group dancing they held. 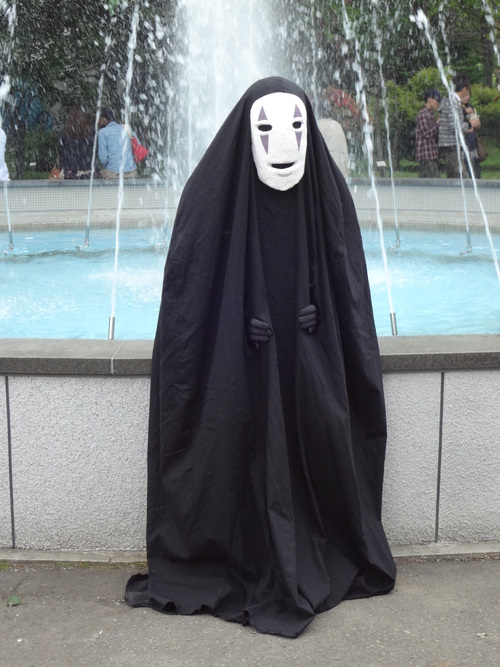 All the dancers were dressed in Cosplay, was it ever a sight to see. All the dancing was preformed to popular Hatsune Miku songs. 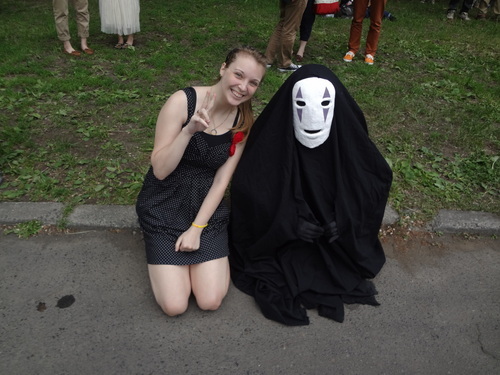 But the best thing I saw was a person who cosplayed themselves as "No face" (カオナシ) of "Spirited Away" (千と千尋の神隠し) I am including a few pictures of it for you. Overall it was really fun. I also was able to enjoy a bit of Yosakoi with some of my friends. It was my first time every seeing a dancing festival. It was so fun. Everyone was so happy to be there and some of the groups were so talented. I really had a great time. Well I hope you enjoyed this blog about the fun things I've been able to do and see this month. Summer is soon upon us and I hope to blog more of some more interesting experiences next month. What can I tell you about the past month here in Sapporo. First of all, I want to say it is great that I met many people in chit chat cafe and I hope you also did enjoy the time with me! So last Friday I went with two Japanese friends to YOSAKOI festival. For me it was the first time there and it was very great and interesting. One of my friends had to tell a lot about the festival because she was dancing there herself ten years ago! 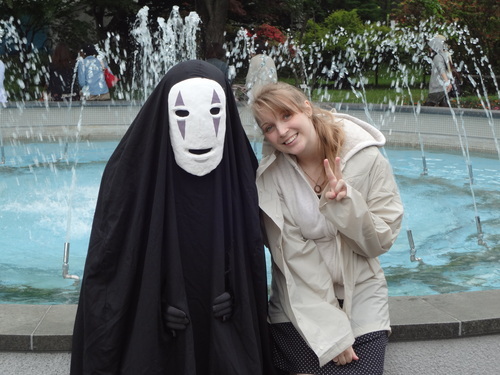 I also did enjoy just the atmosphere in Odori park. We went there in the evening to see some stage performances. I am really looking forward to all other festivals in Sapporo in the next few month. The people are very friendly and kind so I can enjoy every moment. Sometimes I try to compare the atmosphere between Tokyo and Sapporo but I think it is nearly impossible because in Sapporo nearly everything feels different to me! I am really excited about what will come in Summer! I think my favorite festival will be the BEER FESTIVAL ... haha ... maybe because I am German. My blog is short today because I will leave home soon to go to chit chat cafe to see you :o)! Maybe you also went to YOSAKOI festival and can tell me about your experience.